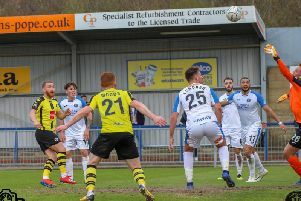 The former Leeds United and Chelsea prodigy started a game for the first time since December as the Wetherby Road outfit' recorded a 2-1 success at Havant & Waterlooville on Saturday. Woods netted Town's opening goal and looked a threat throughout, playing a number of incisive passes in a display which asked serious questions of the home defence. "It was nice to be involved," he said of what was just his third National League start since re-joining the club from Hartlepool United back in November. "I've had to be patient and sit and wait for my chance, so it was just good to get it. "I got to play in my favoured role and had licence to go and play because the gaffer was keen for us to get back to passing the ball and keeping it on the deck, and I think I did okay. "It was nice to come in and be able to help the team. I was really happy. With other results going our way elsewhere, it was a pretty good day all-round." Woods admitted that he has found it tough sitting on the sidelines in recent months and says he is determined to keep his place in the starting line-up between now and the end of the season. "I'm not going to lie and say I haven't been frustrated, because I have. I'm the same as anyone, I just want to play," he added. "I knew when I came back here that it wouldn't be easy to break into what has been a winning team and I've had to stay patient. "You can either moan about not playing and feel sorry for yourself or get your head down in training and make sure you're ready when an opportunity comes. "There's real competition for places here, which is a good thing, however I want to stay in the team now and try and help the club make history once again. "You can't rest on your laurels because you're only ever as good as your last game, but you've got to back yourself and I'm hoping to be involved in all of our remaining fixtures. "We're a side who can beat anyone on our day and we believe we can go all the way in the play-offs. Why wouldn't we?"